Time has been a great and loyal companion for our famous institution. Years have gone to pass and Velez College had paved its way to glory and fame in the name of excellence and service. But in a larger vision, it is not only in academics where the institution had carved its name out of. The school has been pretty much busy making its way to popularity in different aspects labeled by the people. Being known to be one of the oldest schools in the city is a fact and perhaps the Velez College Library proves this truer than true (not to mention the Extension Area which backs everything up). Yes, the school could be up for a vintage auction but you can never question the quality of education it provides. To match the level of academic quality, the institution has slowly built and upgraded the facilities vital to the learning of its children. The change may have taken years to befall but time was kind enough to show it. In this modern day, every Velezian will be proud to know that the institution has taken another great step towards development. Velez College steps into the Matrix as it utilizes the ingenious invention of man – the internet. 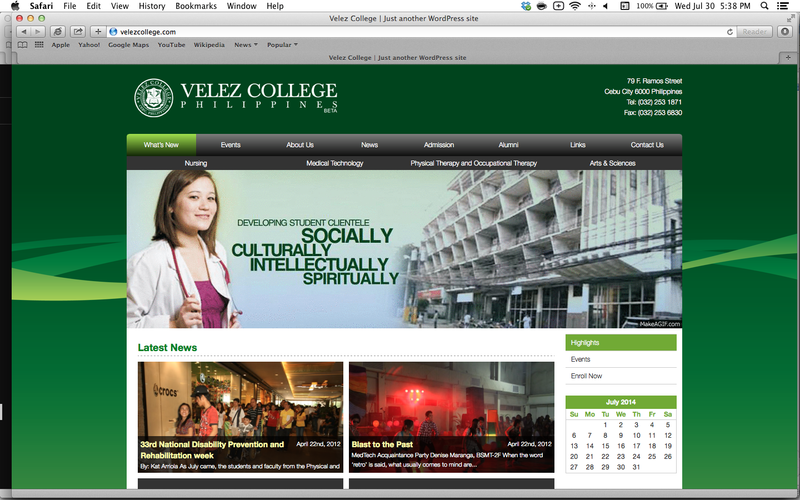 Velez College launches their official school website as a way of communicating to everyone who has walked in and out of the school halls and to those who are yet to come. The Official Velez College website is an initiative instigated by the Velez College Administration headed by Mr. James V. Ting in collaboration with the SSA Team supervised by Ms. Kathyrine Cabatingan with the purpose of connecting Velezians all over the world in the advent of technology. News and updates are up online and the students and alumni will never again miss another event about their beloved institution. It has been almost 60 years since the institution had its first graduates from the College of Nursing. In a way, the thread of connection between the school and its products has been reinforced breaking through the fabric of time. The website is also a way of marketing for it reaches out to other aspiring students who are enthusiastically curious about the school. The website is manned and run by the brilliant brains of Drawingboard Creative Studios Inc. providing us with the best service the company has to offer. It ensures a secure and stable server and provides an interactive user interface not only for internet whizzes but also for the newbies of the net.